Kat Kitay is writing on the Svbtle network. In the last 6 months I made some big changes. I left my career in product management, moved out of NYC to spend time abroad, rediscovered programming, and came back for the Recurse Center. I’m at RC to refocus my life around coding, making, and being in the zone. This post is about my new motivations and a lesson I learned in finding fulfilling work. Product management wasn’t for me, but I’ll write about that another time. I left my last job pretty burnt out. Nothing excited me except getting as far away as possible. For a few months, I traveled and lived on savings. I didn’t touch my computer. Over the summer, I searched and searched for my true passion, hoping something magical would hit me and carry me somewhere new. But it never happened. It probably doesn’t exist, but some people seem to experience it anyways. You may have many loves in your lifetime or struggle to find just one. You may fall into it instantly or out of it over a long, painful time. Maybe they seem great on the outside, but when you’re committed, it’s awful. I imagine passion follows the same nebulous, magical rules. That experience made technology and the future new and exciting again for me. All of my jadedness disappeared. I started figuring out how to get plugged into programming communities and set my life up to code more. Was that passion? Coined by the psychologist Mihály Csíkszentmihályi, flow is a mental state of being completely absorbed in your work. It’s known to us as “being in the zone.” It’s theorized that flow states are intensely positive experiences that can increase satisfaction and happiness in your life. The flow state is achieved by performing a focused task with a clear goal that is challenging but still within the edges of your abilities. In Csíkszentmihályi’s research, he found that people in flow states experienced feelings of ecstasy, inner clarity, and pure enjoyment of doing work for its own sake. 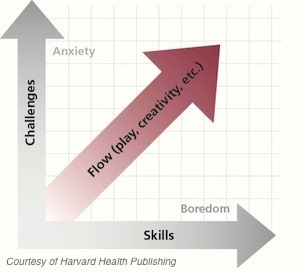 People who experience flow frequently are reported to be happier and more sociable. Writers, athletes, children, monks, and carpenters can all experience flow; it’s not exclusive to any kind of work or person. Everyone has probably experienced flow in their lives. To be in flow is to actively experience the process of self-development. It creates space for all your anxieties and stressors to fall silent. It “leads to increasing complexity and growth in consciousness” and creates a positive feedback loop of fulfilling work and feelings of competency and well-being. I don’t think “passion” is a realistic or wise pursuit of life anymore. There are a lot of people who agree with me: you can’t count on finding a singular passion; if you do, it may be a terrible career choice; and a belief in a predetermined passion strips you of control over your own life. But you can achieve flow, not just in one thing, but in many parts of your life. Think about times in your job or personal life in which you’ve been so in the zone that everything else disappeared. What were you doing? What conditions made it possible? What can you do to find your flow every day? Personally, I’ll be paying much closer attention to my time in flow, learn how to defend it (I know that’s a problem for many), and use it as a compass for satisfaction in work and life. If you’re feeling passionless, apathetic, or stuck, try to look for activities (present or past) that put you in flow. Maybe you’ll find something you weren’t expecting.